WASHINGTON (CNN) -- President Bush lifted an executive order banning offshore oil drilling on Monday and urged Congress to follow suit. Citing the high prices Americans are paying at the pump, Bush said from the White House Rose Garden that allowing offshore oil drilling is "one of the most important steps we can take" to reduce that burden. However, the move is largely symbolic as there is also a federal law banning offshore drilling. Bush has been pushing Congress to repeal the law passed in 1981. "There is no excuse for delay," the president said in a Rose Garden statement last month. iReport.com: Is drilling the answer? "In the short run, the American economy will continue to rely largely on oil, and that means we need to increase supply here at home," Bush said, adding that there is no more pressing issue for many Americans than gas prices. The issue has gained prominence in the presidential race. Sen. John McCain recently announced he supported offshore oil drilling, reversing his previous stance. Sen. Barack Obama wants to keep the ban in place. 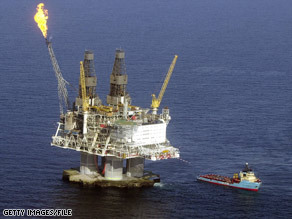 Experts say offshore oil drilling would not have an immediate impact on oil prices because oil exploration takes years. "If we were to drill today, realistically speaking, we should not expect a barrel of oil coming out of this new resource for three years, maybe even five years, so let's not kid ourselves," said Fadel Gheit, oil and gas analyst with Oppenheimer & Co. Equity Capital Markets Division. But it almost certainly would be profitable. Candida Scott, an oil industry researcher at Cambridge Research Associates, said oil needs to be priced at $60 a barrel or more to justify deep-shelf drilling. With oil now selling for $145 a barrel, companies are almost assured of profiting from offshore drilling, Scott said. In his statement last month, Bush also renewed his demand that Congress allow drilling in Alaska's Arctic National Wildlife Refuge, clear the way for more refineries and encourage efforts to recover oil from shale in areas such as the Green River Basin of Colorado, Utah and Wyoming. The White House estimates that there are 18 billion barrels of oil offshore that have not been exploited because of state bans, 10 billion to 12 billion in the Arctic National Wildlife Refuge and 800 billion barrels of recoverable oil in the Green River Basin.